A trigger point is a localized area (palpable nodule) of extreme tenderness found within a muscle. The area of tenderness is caused by a heightened state of muscle activity that results in a small sustained muscle contraction. After a prolonged period of time, a taut band develops that will not relax volitionally. Trigger points are referred to as “active” when they cause noticeable pain without provocation, while “latent” trigger points elicit pain only when manipulated by the therapist. Why did I get a trigger point? While the cause of trigger points is not completely understood, many precipitating factors are associated with their onset. Trigger points may be due to muscle overload, trauma, sustained shortened position, or radiculopathy. Other causative factors include arthritis, joint dysfunction, emotional stress or other existing trigger points. Trigger points are often exacerbated by poor posture, repetitive motion or nutritional deficits. Why is it important to treat a trigger point? Trigger points can cause pain, inhibit muscle function, and decrease muscle strength. Pain is either localized to the area of the trigger points or refers pain to other areas. The symptoms combined with any muscle weakness and/or decreased range of motion, results in altered movement patterns and impaired function. Therefore, release of these nodules is essential to decrease pain, increase strength and range of motion, and improve movement and functioning. What is the treatment for trigger points? Several modalities such as ultrasound and electrical stimulation are commonly used to treat trigger points, but the success rate is marginal, especially in chronic conditions. Manual therapy techniques including soft tissue mobilization, manual compression techniques, and stretching deliver favorable results. However, these modalities can sometimes be painful or the trigger point may continue to persist. Dry needling is another technique that has shown to be one of the most effective procedures for releasing trigger points. Dry needling is often performed in conjunction with these other techniques. By using filament needles, therapists can manipulate and release deeper muscles which are difficult to reach using other techniques. What is Dry Needling and does it hurt? 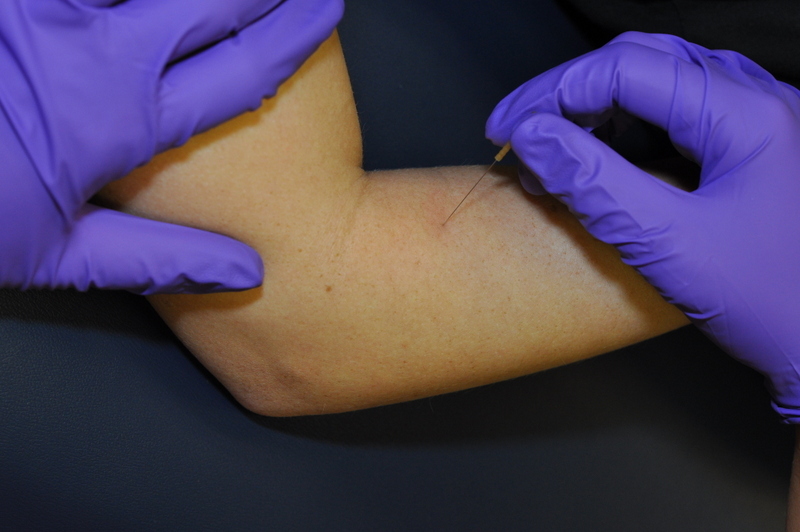 Dry needling involves solid filament needles (similar to those used in acupuncture), which are placed into the trigger point to produce a local twitch response (LTR). The needles are very thin and rarely felt entering the skin. The LTR is therapeutically essential for treatment, because it is followed by a period of reflexive relaxation of the muscle. When a person experiences a LTR, they will often feel a cramping sensation or discomfort in the referral pattern of the muscle lasting a few seconds. Studies have also shown that when the increased tension in a trigger point is resolved, other trigger points within the pain referral zone may resolve as well. Most patients experience soreness after needling, which can last anywhere from a few hours to 2 days. It is suggested that patients use ice or moist heat to decrease this soreness. In addition, it is imperative that patients move the body part recently needled to decrease any soreness. Typically, patients experience the results in 3 sessions. However, additional sessions may be needed depending on the chronic nature of the trigger point and other contributing factors. After dry needling breaks the pain cycle by resolving the trigger point, other treatment techniques focusing on myofascial release, neuromuscular re-education and strengthening will be introduced into the rehabilitation program. What should I do between treatment sessions? Think of releasing a trigger point as hitting the reset button. After treatment, the muscle must be trained to re-gain its normal length (extensibility) and to restore normal contraction and control of the muscle. Therapists instruct patients in the proper exercises to accomplish this. Avoid strenuous exercise that involves the muscles treated, unless otherwise instructed by your therapist. Move!!! Patients must use the affected body part in a normal manner. Contact us today for more information about trigger point dry-needling.